Do you have an idea for the next big crowdfunding product? Whether it’s in the realm of the Pebble Smartwatch, the Super Troopers 2 movie or the Coolest Cooler, crowdfunding gives you an opportunity to ask regular people if they’d like to contribute to your project. A huge deterrent for wannabe entrepreneurs is startup capital. Some aren’t willing to go on Shark Tank or talk to venture capitalists, while others simply recognize that connecting with fans online is the most efficient way to bring in money. People start eCommerce stores for all types of reasons. Those reasons don’t matter, since there’s a crowdfunding platform out there for just about anything. From movie crowdfunding platforms to charity sites, and communities to crowdfunding tools for your own site, the options are endless. Therefore, we compiled the best crowdfunding platforms in a list below, along with pricing/fees, a little about each one and the companies and individuals that should take advantage. 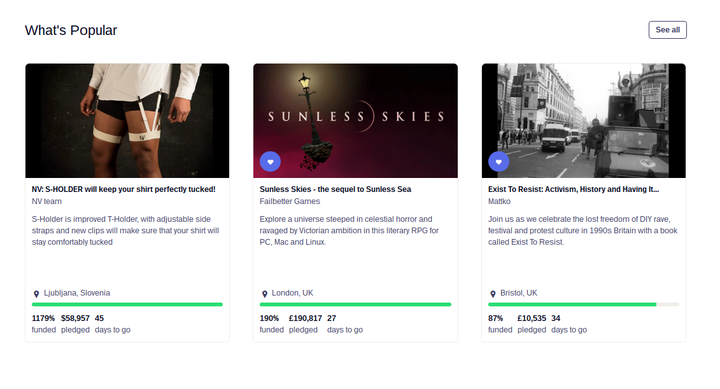 Kickstarter is the most popular crowdfunding site by far, with the quintessential project page layout that most themes are based off. The good thing about Kickstarter is that they do a wonderful job of promoting some of the more interesting projects on the site. In addition, Kickstarter has a large community of committed users who constantly look for the next big thing. The main downsides are that the fees are a little higher than other platforms, and you have to compete with the thousands of other listings. Who Should Consider This Crowdfunding Platform? People with unique inventions where you have a good chance of getting showcased. Technology projects seem to do well on Kickstarter. Any category from photography to music and bikes to robots. Those who think they can fight through the clutter and really make their product pages shine. 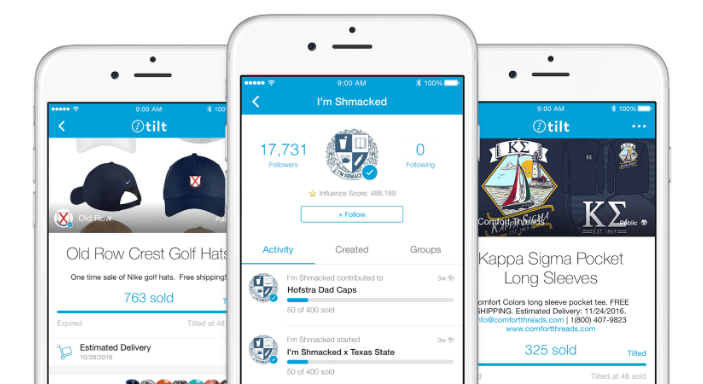 Tilt takes an entirely different approach to crowdfunding. It’s sold as a social payments app (similar to Venmo,) but they have the tools needed for requesting funding for projects, products, events and more. We like it best for companies and entrepreneurs that want to test their new ideas, since you can crowdfund to meet a minimum sales threshold, with no risk to the user if it doesn’t pan out. Oh yea, and you can run your campaign through your website. People wanting to test out if their idea has legs. Those who have a friend or family community to turn to for funding. Those who would like to make the payment process faster. Technology and the arts seem to be most popular on Indiegogo, but it supports everything from comics to food and gaming to religion. The main problem people have seen with Indiegogo is if the merchant or entrepreneur goes with the flexible funding plan, which means that the funders might not get their money back if the goal isn’t reached. However, you can just go with the regular funding plan (all or nothing) to avoid people getting mad. People trying to fund technology and art projects. Those who want to engage a smaller community, straying away from the clutter of Kickstarter. Those who might want to take the risk and go with the flexible funding plan. These don’t get funded much, but it could still give you enough capital even if you don’t reach a goal. 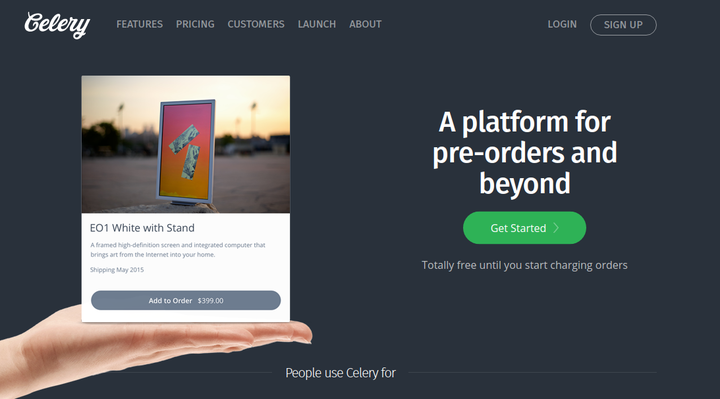 Although you’re only allowed to use the Stripe payment gateway, Celery has an abundance of tools for custom crowdfunding and pre-orders, all setup on your own website. The high-conversion one-step checkout gets placed on your website, where you can charge right at that moment or decide to charge later (for seeing how much demand there is for a product). The combination of pre-orders, crowdfunding and abandoned cart tools is enough to give Celery a hard look. Anyone who would also like to have some sort of pre-ordering functionality. Entrepreneurs who would like to avoid the high fees from Indiegogo and Kickstarter. Shopify is one of our go-to eCommerce platforms, but did you know you can configure your own crowdfunding site as well? Although Shopify doesn’t seem like the logical choice for crowdfunding right out of the box, it has the right apps and themes to get you in the right place. For example, all you have to do is sign up for Shopify, then install the Crowfunding Manager app. 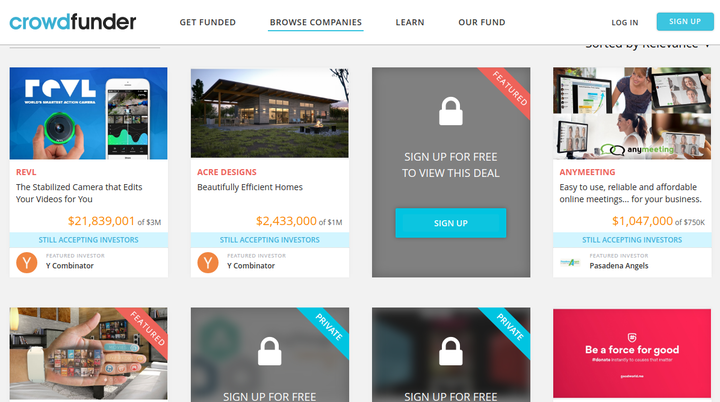 They used to have a free theme built for crowdfunding, but that seems to have disappeared. Companies and individuals who need a full eCommerce site and a crowdfunding platform. Those with a little extra monthly cash to spend. This option is recommended for beginners and advanced users, since its easy to configure Shopify, yet you also have the custom coding options for advanced edits. Crowdfunder is not for the budget-less startups. The platform clearly states that it’s a community of angel investors and venture capitalists. Therefore, you have a lower chance of getting funding, but it connects you with people with big pockets. Many of the projects on here go for millions of dollars, akin to the typical funding rounds you would see in Silicon Valley. The great news is that you get to connect with big-time investors who could potentially become part of your team in the future. Companies that like the potential of partnering with notable VCs and angel investors. Those who have an absolutely flawless business plan and (preferably) money coming in already. People who are willing to pay the high monthly costs in order to take the risk and get linked up with a rich person. 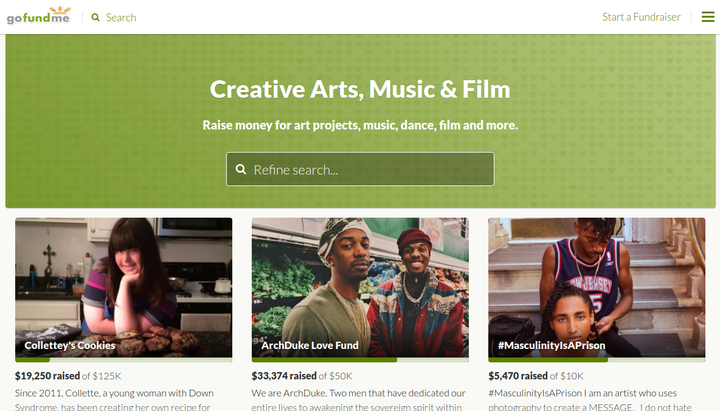 GoFundMe has a unique approach to crowdfunding, since the majority of the campaigns are for charity or good causes. That’s not to say you can’t use it for your new business idea though! However, you’ll notice that most business or product ideas have some sort of sad or inspirational story behind them. For example, one of the current projects is to fund a cookie company made by a girl with Down Syndrome. People funding school sporting events (combines nicely with a merchandise eCommerce store). Projects that bring together the community or create some sort of art. Seed and Spark only focuses on movies. Since filmmakers need eCommerce shops as well, it makes sense to highlight this gem of a crowdfunding source here. It basically breaks down the whole production so that contributors can give money to certain facets of the show. For example, you may want to throw some money in the ring and specify that it goes towards cameras or casting. Anyone making videos or movies, even if it’s something like a YouTube show. Patreon funds creatives with a subscription-based crowdfunding system. It works by asking people to subscribe to your Patreon account. After that, they tell the system how much they would like to contribute on a monthly basis (so you get recurring income). I’ve noticed this model used by podcasters, comic book artists, YouTube stars and many more. It’s a truly wonderful way to accumulate consistent income for all of your hard work. Those who want recurring income. Anyone who makes podcasts, comics, comedy, games, animation, writing, theater, music and more (and they want to start getting paid for it). Fundable has a similar setup as Crowdfunder, where the backers are more serious about funding businesses and new products. The best part is that you can offer rewards or equity to your contributors, and the whole point is to tap into bigger contributions than you find on other crowdfunding platforms. Companies that are willing to give out equity. Those looking to connect with big-time investors. 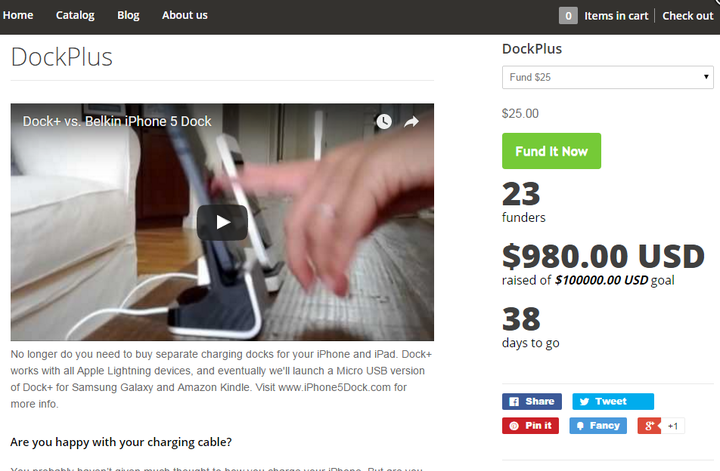 Figuring out the best crowdfunding platforms for your products should take a little thinking. Consider what you plan on funding, why you’re doing it and what types of people land in your target demographic. After that, you should be able to select one of the crowdfunding platforms listed above. If you have any questions about the best crowdfunding platforms, let us know in the comments below.